Scholl was raised as a Lutheran, although he did at one point consider converting to Catholicism. Hans was enrolled in the military service in spring of 1941 as a medic in France against Russia. Scholl joined the Hitler Youth in 1933, but quickly became disillusioned with the group when he realised its true principles. He later studied medicine at Ludwig-Maximilians-Universität München Medizin. In the early summer of 1942, Scholl, his sister Sophie, Willi Graf, Kurt Huber, Christoph Probst and Alexander Schmorell co-authored six anti-Nazi Third Reich political resistance leaflets. Calling themselves the White Rose, they instructed Germans to practice nonviolent resistance against the Nazis. The group had been horrified by the behavior of some German soldiers on the Eastern Front, where they had witnessed cruelty towards Jews in Poland and Soviet Union. The leaflets were distributed around the Ludwig Maximilians University of Munich,, where the group's members studied, and at the University of Hamburg. Leaflets were also mailed to doctors, scholars, and pub owners throughout Germany. On 18 February 1943, Hans and Sophie were spotted by a custodian while throwing leaflets from the atrium at Ludwig Maximilians University. They were arrested by the Gestapo and, with Probst, tried for treason by Judge Roland Freisler. They were found guilty and condemned to death on 22 February. Only a few hours after the judgment, Hans and Sophie Scholl and Christopher Probst were beheaded by Johann Reichhart in Munich's Stadelheim Prison. The execution was supervised by Dr. Walter Roemer, the enforcement chief of the Munich district court. Scholl's last words were "Es lebe die Freiheit!" ("Long live freedom!"). Shortly thereafter, most of the other students involved with the group were arrested and executed as well. Following the deaths, a copy of the sixth leaflet was smuggled out of Germany through Scandinavia to the UK by German jurist Helmuth James Graf von Moltke, where it was used by the Allied Forces. In mid-1943, they dropped millions of copies of the tract, retitled The Manifesto of the Students of Munich, over Germany. The White Rose's legacy has been considered significant by many historical commentators, both as a demonstration of exemplary spiritual courage, and as a well-documented case of social dissent in a time of violent repression, censorship and pressure to conform. It is possibly the most spectacular moment of resistance that I can think of in the twentieth century... The fact that five little kids, in the mouth of the wolf, where it really counted, had the tremendous courage to do what they did, is spectacular to me. I know that the world is better for them having been there, but I do not know why. You cannot really measure the effect of this kind of resistance in whether or not X number of bridges were blown up or a regime fell... The White Rose really has a more symbolic value, but that's a very important value. Hans was portrayed by Fabian Hinrichs in the film Sophie Scholl: The Final Days. ^ "Inge Aicher-Scholl" at the Wayback Machine (archived December 31, 2007). 6 September 1998. Archived from the original on 31 December 2007. ^ "Inge Scholl: 'Die Weiße Rose'" (in German). Weisse-Rose-Studien. Archived from the original on 12 October 2007. ^ Halpern, Sue M. (17 August 1986). "Students Against The Reich". The New York Times. Retrieved 11 June 2008. 2959 Scholl, provisional designation 1983 RE2, is a carbonaceous Hildian asteroid from the outer regions of the asteroid belt, approximately 34 kilometers in diameter. It was discovered on 4 September 1983 by English–American astronomer Edward Bowell of the Lowell Observatory at Anderson Mesa Station near Flagstaff, Arizona. 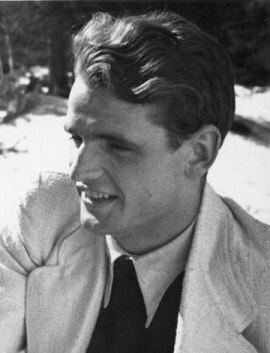 The asteroid was named after German astronomer Hans Scholl. Geschwister-Scholl-Platz (Scholl Siblings Plaza) is a short semi-circular plaza located in front of the main building of the Ludwig Maximilian University of Munich (Ludwig-Maximilians-Universität München), located on the Ludwigstraße in Munich, Germany. The plaza is named in memory of Sophie Scholl and her brother, Hans Scholl, students at Ludwig Maximilian University of Munich during World War II who were among the founding members of the White Rose (Weiße Rose) resistance movement. They were the Geschwister Scholl (Scholl Siblings). Hans Scholl (born 1942) is a German astronomer, who worked at the Astronomisches Rechen-Institut in Heidelberg, Germany, and at the Côte d'Azur Observatory in Nice, France. In 1999, he was part of a team that discovered three moons of Uranus: Prospero, Setebos and Stephano. He has also co-discoverered 55 minor planets together with Italian astronomer Andrea Boattini at ESO's La Silla Observatory site in northern Chile during 2003–2005.Scholl is known for his theoretical work on the orbits of minor planets. He has studied the orbital resonance of outer main-belt asteroids, as well as the orbits of 2062 Aten, a near-Earth object, and 2060 Chiron, a centaur and comet. His broad range of minor planet research included problems from mass determination to asteroid missions and from libration to depletion. He was honored by the outer main-belt asteroid 2959 Scholl, discovered by English–American astronomer Edward Bowell in 1983. Lutz-Michael Harder (born 1951, Langenfeld/Długoszyn near Küstrin) is a German lyric tenor known mostly for his interpretation of Mozart opera roles and as a baroque concert soloist. Paaliaq ( PAH-lee-ahk) is a prograde irregular satellite of Saturn. It was discovered by Brett J. Gladman, John J. Kavelaars, Jean-Marc Petit, Hans Scholl, Matthew J. Holman, Brian G. Marsden, Philip D. Nicholson and Joseph A. Burns in early October 2000, and given the temporary designation S/2000 S 2. It was named in August 2003 after a fictional shaman in the book The Curse of the Shaman, written by Michael Kusugak, who supplied Kavelaars with the names of giants from Inuit mythology that were used for other Saturnian moons. Paaliaq is thought to be about 22 kilometres in diameter, and orbits Saturn at an average distance of 15.2 million km in 687 days. It is a member of the Inuit group of irregular satellites. It also has a proximity with 9 other moons reaching up to ten miles from each. It is light red in color, and in the infrared the Paaliapian (Paaliaqan) spectrum is very similar to the Inuit-group satellites Kiviuq and Siarnaq, supporting the thesis of a possible common origin of the Inuit group in the break-up of a larger body.